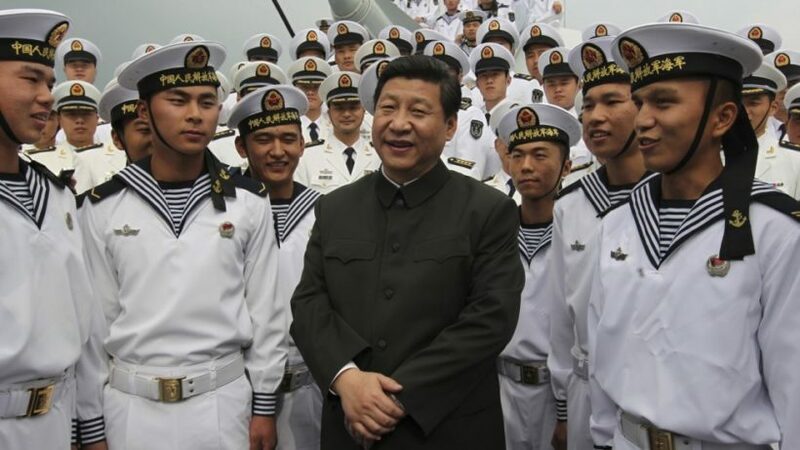 Chinese President Xi Jinping stands with PLA sailors. [*The PLA (People's Liberation Army) is the armed forces of the People's Republic of China and the Communist Party of China.]. 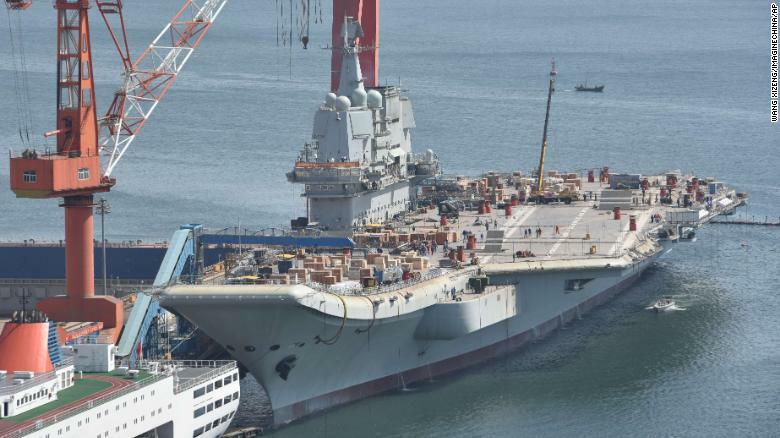 (by Ben Westcott and Brad Lendon, CNN) – China’s first domestically built aircraft carrier began sea trials on Sunday, a historic step in the country’s mission to build a navy capable of rivaling the world’s leading maritime powers [U.S., Russia, UK, Japan, France and India]. The 50,000-tonne ship will become the country’s second aircraft carrier, and the first to be entirely built and designed inside of China, when it joins the PLA navy* sometime before 2020. [*The PLA (People’s Liberation Army) is the armed forces of the People’s Republic of China and the Communist Party of China.]. Chinese workers labor on the deck of China’s first domestically built aircraft carrier, the Type 001A, at the shipyard of Dalian Shipbuilding Industry Co., Ltd. in Dalian city, northeast China’s Liaoning province, 16 April 2018. The ship, which is 1,033 ft in length and 246 ft wide, uses conventional rather than nuclear propulsion, and is believed to displace 50,000 tonnes, according to reports in China’s state media. [Naval experts said the Chinese engineers and designers behind the warship had studied the most advanced military technology used in the US, as well as the former Soviet Union, and tried to incorporate it into the new carrier to meet the practical needs of the PLA Navy.]. First published at CNN on May 14, 2018.
b) What announcement did President Xi make prior to the launch of the Type 001A? c) This is the first aircraft carrier China has built. The communist country has one other carrier. How did they obtain that vessel? d) How/why are U.S. aircraft carriers still far superior to this newly built Chinese vessel? e) Read the “Background” below. What do you think the U.S. should do going forward to ensure our naval (and overall military) superiority over China’s communist regime in the coming decades? China may still be a long way from presenting a global challenge to the US Navy, but as a regional power its military program is moving fast. With a military budget in 2018 of $175 billion dollars, up 8% on the year before, the Chinese military is pushing ahead rapidly with its modernization drive. Between 2010 and 2017, the Chinese Navy increased its complement of ships from 210 to 320, Boston College professor of political science Robert Ross told CNN, including another 18 in 2016 alone. By comparison, the active US fleet currently sits at approximately 272 ships, he said. “The US Navy and the capability for the US Navy will still be superior to the Chinese Navy in 10 years, but the size of the Chinese fleet will be larger and they’ll have closed the gap in technology and training,” Ross said. China has made no secret of its desire to build a modern, “blue-water” navy which could operate around the world. [A blue-water navy is a maritime force capable of operating globally, essentially across the deep waters of open oceans.]. “If you look at China’s acquisitions of facilities in the Indian Ocean and in Eastern Africa, they’re quickly developing the capability to maintain a naval presence in distant waters,” Ross said. Still, the main focus of the PLA Navy in the near future is expected to be dominating the waters around the Chinese mainland, including the South China Sea. Last week, US intelligence assessed that there is a high probability the Chinese military had deployed anti-ship and anti-aircraft missiles to three artificial islands there during recent military drills.